NOTHING ABOUT THIS MAKES ANY SENSE on this week’s recap of CW’s The Flash. Time for the Season Two finale! “Metapocalypse” is the best portmanteau I’ve heard since they invented beer monsters called “Alementals” in World Of Warcraft. Anyway, here’s this week’s all-Becky recap of CW’s The Flash. Episode 22 opens on absolute chaos. The city is a literal war zone between the CCPD and an army of unidentified metahumans, although longtime DC Comics fans might be able to identify a few. The Flash is running everywhere, fighting back against the “metapocalypse” and Caitlin is back with Team Flash. It could have been worse – Barry could have been sucked into the Speed Schwartz in this week’s recap of CW’s The Flash. When I watched this episode when it first aired, I remember not liking it. I felt it moved too slowly and, after the last couple of episodes, was lacking in excitement. Rewatching it, that first complaint goes right out the window. Have you seen this plushie? Contact Becky if you have, and meanwhile, here’s this week’s recap of CW’s The Flash. 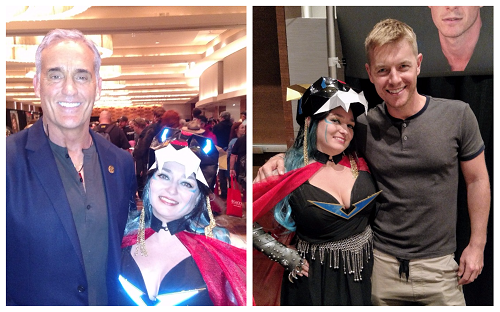 Okay, so I missed reviewing the last episode because I was at Dragon*Con meeting John Wesley Shipp and Rick Cosnett (#ProtectEddieThawne2017) in person. This is probably for the best because the villain that week was Griffin Grey, and that unlocks my rants about The Flash: Fastest Man Alive‘s story arc and how to do 90% of your Flash writing wrong. Starting with– nope. Not doing that. Where does one even get life-sized cardboard cutouts of an otherdimensional serial killer’s dead parents? This question and more goes completely unanswered in this week’s recap of CW’s The Flash. We start this week with the origin of Hunter Zolomon. I’d like to see you guys try to come up with clever introductory text while you’re not feeling all that well, is all I’m saying before this week’s recap of CW’s The Flash. So we kick off the episode with Barry regretting how once again Barry has messed up by trusting the wrong person. The wrong villain speedster. Wow, they coulda had a V8 and saved themselves a lot of trouble in this week’s recap of CW’s The Flash. This episode of The Flash is about deception, whether it’s self-deception or deceiving others. We’re gonna need a bigger context on this week’s recap of CW’s The Flash. This week, I heartily recommend this Season Two episode, although you might find the ending a little disheartening. I’m glad we had this little heart-to-heart before getting into this recap of CW’s The Flash. Welcome back to the heartwrenching conclusion to the Earth-2 storyline. So it occurs to me that an alternate universe version of Joe West could theoretically be called a “poppelgänger” and you can’t fire me I’m the boss. Enjoy this recap of CW’s The Flash. So it’s time for the fun Elseworlds issue…uh, I mean episode of The Flash. There’s a 1940s retro aesthetic in the alternate universe of Earth-2, but more advanced technology than Team Flash has access to on Earth-1.